The Salt Cod with Skin and Bone is cut into 4 - 6 inch pieces. Typically 2 - 3 fish are cut to meet the 20 lb order amount. Collars may or may not be included space permitting in order to fit the 20 lbs in the box. Storage: While still salted, keep in the refrigerator for use within a few months for product you plan to use longer than that store in the freezer. 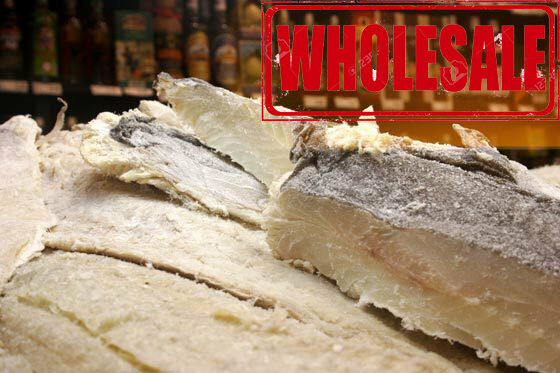 Before consumption, salted fish products must be desalted. The length of the desalting process depends on the thickness of the fish and on how long it has been cured, but is as much as 3 days for the thickest pieces. For the boneless skinless pieces or product typically only 1 day of desalting is necessary. To achieve the best result we have provided these simple guidelines for the desalting process. 1. Take the pre-cut portion of codfish and rinse excessive salt under the tap. 2. Place the fish in a large bowl of water. A general rule is three times as much water as fish. The bowl of fish should be kept in cool conditions, around 43 - 47 degrees Fahrenheit during the whole process. 3. Change the water once a day. 4. Some of the thinner cuts of the fish are ready to be cooked after 2 days . For the thickest cuts we recommend 3 days. After this process either cook or you may freeze for future use / ready to cook.